Our Milky Way is a dusty place. So dusty, in fact, that we cannot see the center of the galaxy in visible light. But when NASA's Spitzer Space Telescope set its infrared eyes on the galactic center, it captured this spectacular view. 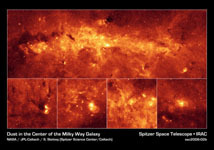 Taken with just one of Spitzer's cameras (at a wavelength of 8 microns), the image highlights the region's exceptionally bright and dusty clouds, lit up by young massive stars. Individual stars can also be seen as tiny dots scattered throughout the dust. 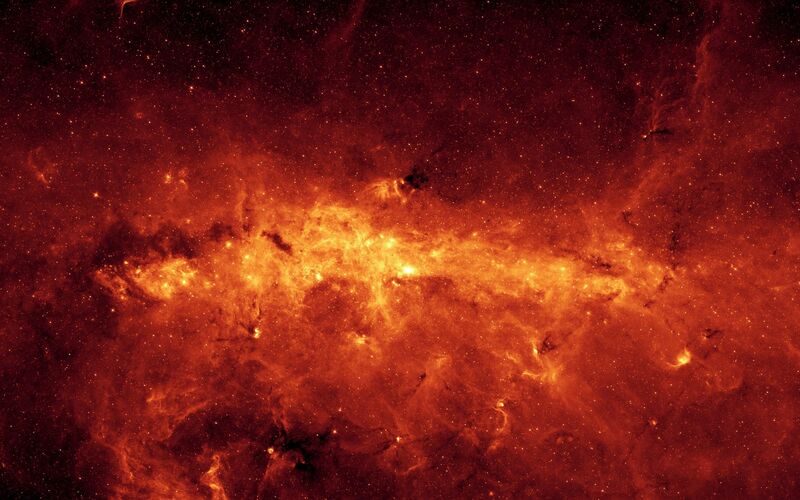 The top mosaic shows a portion of the galactic center that stretches across a distance of 760 light-years. 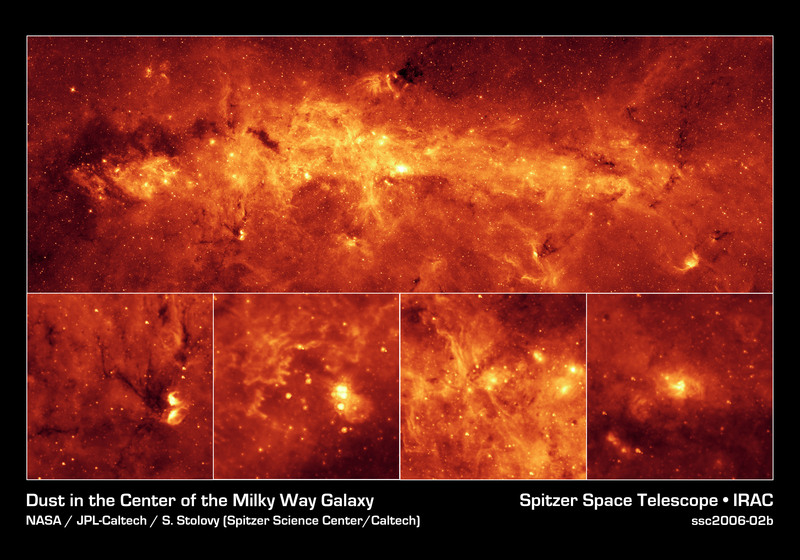 Thanks to Spitzer's excellent resolution, the dusty features within the galactic center are seen in unprecedented detail. Four examples are shown in the magnified insets at the bottom. The farthest left box shows a pair of star-forming regions resembling owl-like cosmic eyes. To the left of the "eyes," dark lanes of dust can be seen. This object is probably located in a spiral arm between Earth and the galactic center, in contrast to the following examples, which are all located at the galactic center. The next inset to the right includes the extremely luminous "Quintuplet" stars, a set of five massive stars believed to have buried themselves in cocoons of dust. Just below and to the right of the Quintuplet is the "Pistol" nebula, a bubble of ejected material from the central, massive Pistol star. The finger-like pillars to the left are part of a structure known as "Sickle." They are similar in size and shape to those in the famous picture of the Eagle Nebula taken by NASA's Hubble Space Telescope. Pillars like these are sculpted out of dense dust clouds by radiation and winds from hot stars. The pillars in the Sickle were likely to have been formed by a cluster of hot stars located to their right but not readily visible here. The third inset highlights a system of long, stringy structures that are seen for the first time near the base of a region known as the "Arched Filaments." These long filaments are about 10 light-years long and less than 1 light-year wide. 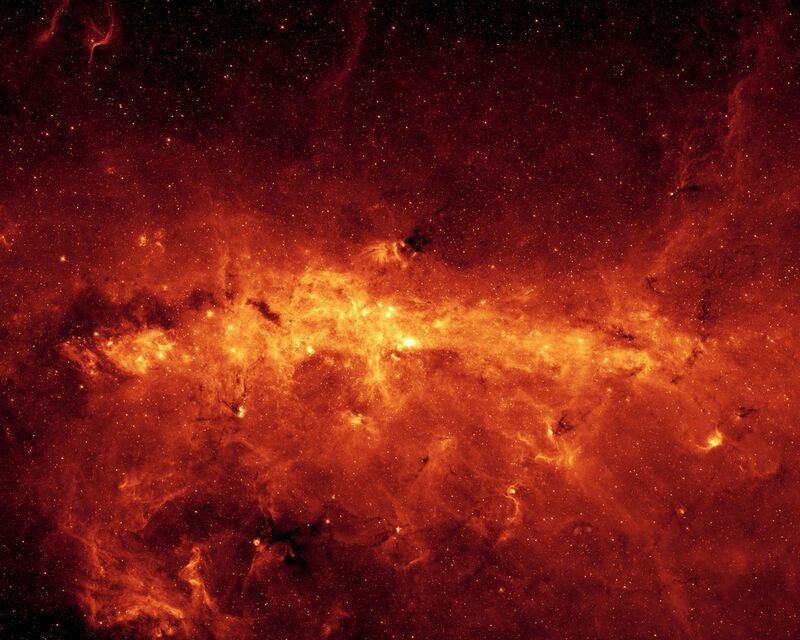 The bright star-forming regions to the right are some of the brightest in the infrared sky. 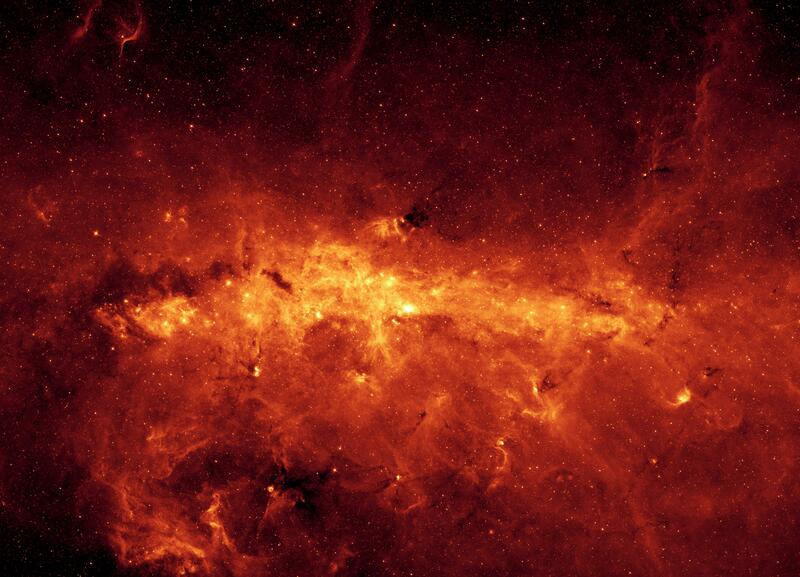 The final inset to the right shows the center of our galaxy, which is the brightest spot in the entire mosaic. The brightness is a result of dust being heated up by a compact cluster of hot stars. The bright spot also marks the location of a supermassive black hole, around which a rotating ring of gas and dust known as the circumnuclear disk can be seen. This image was taken with Spitzer's infrared array camera, using its 8-micron detector. It shows emissions from heated molecules in dust clouds called polycyclic aromatic hydrocarbons.